Notice how the scapulae are clearly NOT sitting flat against the ribcage. Rather, they are pulled away from the ribcage, which makes the spine of the scapulae and the inferior border easily visible. 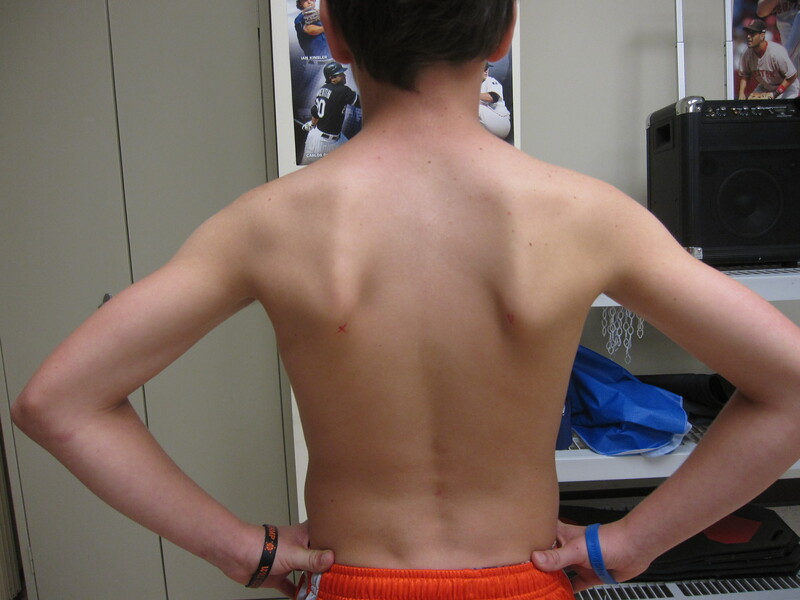 This malady is referred to as “scapular winging”, and it is a fairly reliable indicator of future rotator cuff and elbow injury. When i worked at a physical therapy clinic, an extremely high percentage of our injured throwers exhibited winged scapulae. Your body is designed to work in a balanced state, so when parts of your body are out of whack, it alters the way your body moves. In the case of the shoulder, altered movement patterns due to scapular winging lead to higher amounts of stress on the rotator cuff muscles and the ulnar collateral ligament of the elbow (Tommy John ligament). The simple answer: lots of throwing and no scapular muscle strengthening. Frequent overhead throwing increases tightness in the pectoralis major and minor, which pulls the scapuale forward. This, combined with a lack of scapular control due to poor program design, is a surefire way to ruin your shoulder kinematics. If you suffer from this affliction, the best thing to do is start an exercise program that prioritizes pulling exercises to strengthen the scapular stabilizers, and mobility/soft tissue work to calm down the chest muscles that are pulling the scapulae forward. A good place to start is by performing Blackburns every day. Blackburns take 6 minutes to do and require no equipment, so there’s really no reason not to do them other than laziness. If you’re a baseball or softball player, get somebody to take a look at your shoulder blades for you and see if they stick out. If they do, you’ll want to take care of it sooner rather than later. Injuries don’t just happen to old people, after all.